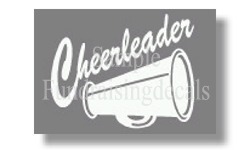 Cheerleading decals, personalized cheerleader decals. Order just 1 or our min. for discount pricing. 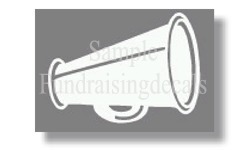 Vinyl decal images shown on this page are the image area only. There is no back ground color or clear. Decals are made from outdoor quality vinyl and made to last a min. of 5 years outdoors. 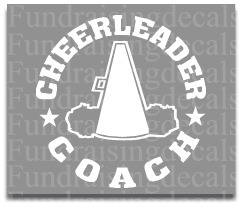 Click about decals below for more info. 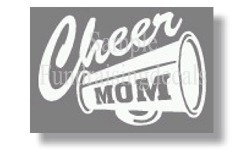 Visit our home page at Decalnetwork.com for more decals and graphics.. Easy online ordering. Buy 30 or more for discount price Only $2.25 each. Retail & Suggested resale price: $6.50 each. Buy 15 or more for discount price Only $3.75 each. Retail & Suggested resale price: $10.00 each.